We had a gloriously sunny bank holiday weekend at the Mill, with various friends coming and going over the course of the three days. My mother and I had been working on a rather exciting product development initiative for gluten-free and so had test-baked a batch of these blinis, which turned out to be just in time to serve to friends who arrived hot from the train from London on the Friday night, along with a glass of something deliciously chilled and fizzy. We used our Shipton Mill organic buckwheat flour, blended with our organic white rice flour. 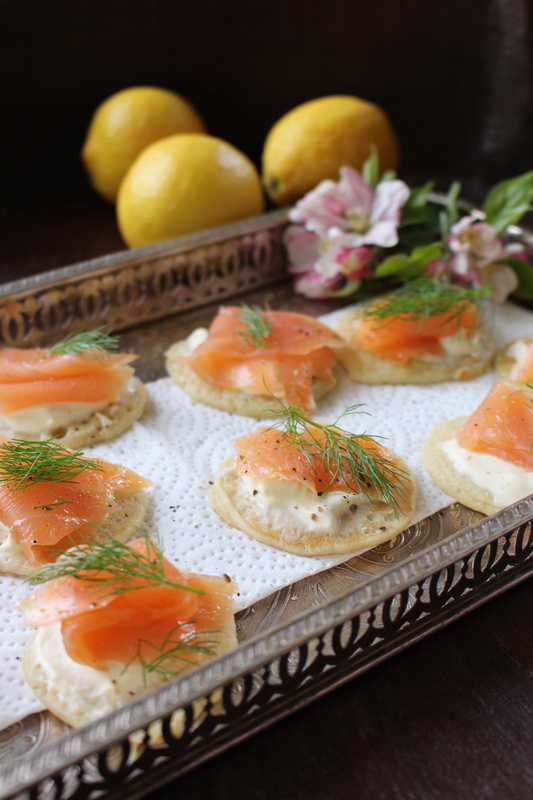 I topped these blinis with smoked salmon, crème fraîche and fresh fennel fronds from the garden (I had been looking for dill, but we don’t have any growing just yet). The touch of aniseed from the fennel worked surprisingly beautifully with the flavours of the buckwheat and smoked salmon, but you can use any garnish of your choosing. The blini bases can also be frozen and kept for up to a month, stored in an airtight container with baking parchment placed between the layers. Separate the eggs and reserve the 2 egg whites in a bowl to be whipped later. Weigh the buckwheat and rice flours and the salt into a mixing bowl. Bring the milk to just under the boil in saucepan, remove from the heat and stir in the dried yeast. Add the 80g of crème fraîche and the 2 egg yolks to the warm milk and yeast, and stir to combine. Pour the warm milk mixture into the flour and whisk into a batter using a hand whisk or an electric hand whisk. Cover with cling film (or you can use a plastic shower cap with elastic around the edge as a reusable option) and leave the mixture to rise for 2 hours in a warm place – I used the airing cupboard. Whisk the egg whites with an electric hand whisk until they form stiff peaks, and carefully fold them into the batter until all the white has disappeared. Place the mixture back in the airing cupboard for 2 hours and cover. It should be frothy and have big bubbles on the surface at the end of the time. Oil a hotplate sparingly with the odourless coconut oil and heat it to a medium heat (or a non-stick frying pan if you don’t have a hotplate). Drop approximately half a tablespoon of batter into small rounds on the hot plate and cook for 30 seconds, then turn over and cook another 30 seconds or until light brown. Remove to a cooling rack and leave to cool for at least 30 minutes. 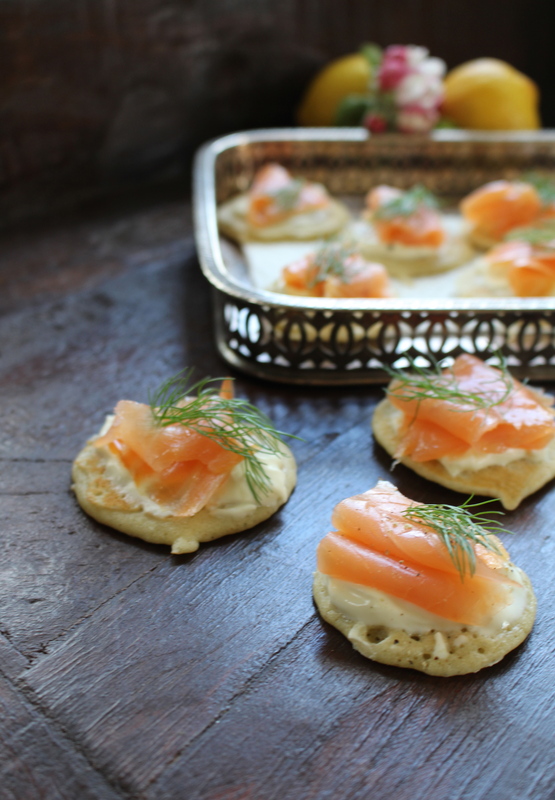 Top with smoked salmon and crème fraîche to serve, and garnish with your herb of choice. Finish with a grating of black pepper and a squeeze of fresh lemon juice just before serving, and consume immediately while still fresh.